Reagan slept like a log last night. Sooooo nice. It's not every night, oh how I wish it were every night, but I'll take what I can get! She's pretty much stopped taking daytime naps altogether...which is not necessarily a good thing. I don't think her little body is quite ready for that. You can tell around 4 or 5ish she starts getting tired but she's a fighter and often stays up past 11pm! She may take a late 15-45min nap but it's just not enough and her nighttime moods are often touch and go. 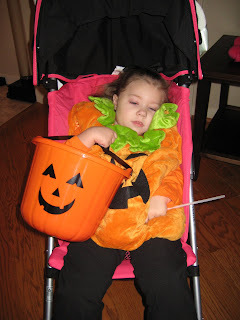 Tonight she went from crying with tummy pains, to OK (that's when we hightailed it down the street for some trick-or-treating), to fussing and crying again. She is eating better though. What a relief. Who knows, maybe that's contributing to some of her tummy pains. More food isn't always better for the tummy. Seizures have been about the same, no doubt better than before, but still there...although she did have a bigger one tonight that worried me a little. We could definitely use some prayers in this department. We need these seizures to stop already! I still haven't heard back from the neurologist, I guess we're looking at Monday. Reagan was up again last night. She was very restless and extremely difficult to get to stay asleep, which made me worry that the casts might be hurting her, but they seem to be OK (although I'm constantly worrying about the possibility of pressure sores). When she woke up at 3am, I fed her a bottle which she ravenously drank down (very unlike her). Her eating has definitely improved today, which is a great sign, hopefully it will continue. She only had one therapy today, vision therapy, which is at our house (when the therapist shows up). It was nice not having to leave. It feels like all we do lately is run from one appointment to the next. It's exhausting. Speaking of exhausting...I am so sick of not being able to get a hold of our neurologist. I left a message today, saying I wanted someone to call us with the results of Reagan's labs before the weekend. Didn't happen. Sometimes her doctor makes his calls on the weekend...sometimes not. So who knows when we'll get the results back. It's beyond frustrating. Would they have called us if something had come back abnormal? Probably not. I bet they haven't even gone over the results yet. Are there any doctors around that still care? Ugh. Reagan continues to not want to take naps. She went all day long with nothing more than a 10min nap in my arms (when I tried to lay her down, she woke back up). Finally she took at super late nap and slept away some of the fussiness. It's hard because she needs to sleep and you can tell she's exhausted but she fights it and fights it. I just hope she's able to get a good night's rest. We all need it. Reagan decided to give me a little grief this morning, waking up at 5am fussing. She didn't really want to go back to sleep and it was 6:45ish before I got her back down again. I took a quick 15min "nap" and then got up for the day. We had an early appt with casting first thing this morning at Texas Children's. This time around she's got permanent plaster casts wrapped in a soft cast. The plan is we'll take them off just before aquatic therapy next Tuesday assuming there are no issues before then. They are super heavy and no fun at all to deal with...it's going to be a long 6 weeks. She was very cooperative for the casting, which was such a relief, because she was not in the best of moods on our drive there. Then we headed down to the pathology lab where they finally had the orders waiting for us. Unfortunately our favorite phlebotomist was out on the floor of the hospital so we had to wait another 45min or so for her to finish up. She was excited to see Reagan and did a great job collecting her blood...not a tear shed. No word on any results from that, hopefully they'll get back to me before the weekend. Then we rushed home for 30min, I fed Reagan, and then we jumped back in the car to go to feeding therapy. Reagan was so funny. Her therapist gave her a bite of some lemon ice and you should have seen the look on her face...it was as if she had bitten straight into a lemon! It was too funny! It must have been the initial shock of the cold and the tart because she took a few more bites of it and it didn't seem to bother her anymore. After feeding therapy we went by our friend's dental office so he could take a look at Reagan's teeth to give us his opinion on what should be done. He said that there's not much we can do as far as preventative maintenance, just try to brush her teeth regularly and rinse her mouth out after bottles. Her teeth show signs of defective enamel due to the seizure medications and that is probably the main reason for the early decay (that and the high carbohydrate intake). He agrees with the plan to cap the bad teeth...he said it's just easier with these cavity filled baby teeth to just cap them and then not have to worry about any other complications in the future. He said he thinks all 4 1st molars need caps and maybe all 4 2nd molars as well...which is crazy because 2 of her 2nd molars aren't even halfway errupted. He said the issue is really with the need to sedate (or anesthetize) her. You don't want to do it now and only fix a few teeth only to find out they have to go back in 6months or less from now. It's best to do everything all at once. I just can't imagine her having to have that many caps put in...much less all at one time! Supposedly it shouldn't cause any pain and she should be able to eat regularly afterwards, but that does worry me a little (or a lot). Today she seemed a little easier to feed. I didn't necessarily get any more fluids in her, but when she did drink, it was less of a fight. Hopefully this will continue and we'll be able to get her numbers up as well. Reagan has been very reluctant to sleep all day, you can tell she's exhausted but when she falls asleep, she can't stay asleep. I sure hope it's not the casts. Please continue to keep her in your prayers. Stress. Stress. Stress. Reagan continues to sleep through the night and that does help a little. Reagan's still not eating though. I've been fighting with her all day but she's just so droopy and lifeless, she doesn't want to do anything, much less eat. We took her to PT this morning and the first 15 minutes went well enough...then the tummy pains hit her. Fits of screaming and crying that lasted 2 hours or so. The rest of PT was spent just trying to console her. I called neurology first thing this morning and asked them to send the orders for the blood test (who is the doctor here), so we went from PT to the pathology lab...where we waited. They didn't have the orders and no one could get in touch with our neurologist. Finally I got through to his secretary and she told me it could be hours before they could get him to write up orders. So I decided to leave with my screaming child and try again tomorrow (after casting). Finally around 3pm they called to say that they were just now sending the orders. Gee thanks. Talk about frustrating! It makes me SO mad. I wanted this done today so we could get the results tonight or tomorrow. Now everything is delayed a day. Frustrating. But what do they care...it's not their kid! Today has just been one of those days...the combination of everything was leaving me feeling stressed. I was really freaking out this morning with the whole eating thing. Reagan only had 6.5oz of formula from 8am-4pm. I was about to have a mental breakdown. She was just not cooperating! Then at 5pm I got another 4oz in her and another 5.5oz at 9pm...for a grand total of 16oz today. Still not great, but so much better than where she was headed this morning. It just worries me. What happens when I can't get enough in her? What then? So stressful. Please keep her in your prayers! Reagan slept well again last night. She was only in bed for a few minutes last night when she woke crying with a huge dirty diaper. I'm sure that helped her to sleep better. It had been 5+ days since she had gone, so I was beginning to worry. This morning she had aquatic therapy. It's a little cool here (for Houston anyway) but the pool is indoors and they keep it nice and steamy and the water is warm. She was actually very smiley and she seemed to enjoy it. Then we changed her, bundled her up, and headed to Feldenkrais therapy. She was relaxed after her swim in the pool and was very cooperative with all the stretches and movements her practitioner was doing. But something is not quite right. It's like she's a different child...you would never peg her for the super chatty and animated girl from only a week ago. I'm not sure what it is. Maybe it's the Botox (but I wouldn't think that would affect her moods or personality). Maybe it's the Banzel. We've got an appt tomorrow at Texas Children's for PT, maybe I'll talk to neurology to see if they could order some blood work just to check her out. You know I'm getting worried if I'm asking for a blood draw. It's just strange. She's SO different. Staring off into space a lot with a blank stare. It's like she feels sick but she's not displaying any symptoms (no fever, no runny nose, no coughing)...but she's still not wanting to eat. She's giving me such a hard time with her bottles. Today (all day) I only got a measily 12oz of formula in her...but Mike got another 2.5oz of pedialyte/water in her tonight and she had another 1.5oz of water mixed in with some oatmeal, so I guess she'll be OK. I really worry about her low fluid intake and how that's going to affect her bodily functions overall. She usually only takes in 16-18oz a day (which is already way below the recommended 32oz for her age/wt) but when she gets really low like this...it concerns me. Please keep her in your prayers. Reagan finally slept last night. And boy did she sleep, I had to wake her up at 9:30 because she was still out like a light. She's still very droopy today. I don't know if all of this is related to the Botox taking a more systemic effect or if maybe she's just not feeling well. It's so hard to tell. I wish she could give us some kind of clue as to what's going on. I spoke to her PT this morning and she said not to worry about the casts. We'll figure it out. So the plan is that we'll take the removable ones with us to aquatic therapy tomorrow and have her look at them and possibly put them back on. Then on Thursday we'll probably be going with a permanent cast (for a week anyway). Reagan had feeding therapy and OT this afternoon. She was very floppy for both but at least she was cooperative. We had a little drama today. Reagan's vision therapist did not show. The last time I spoke with her she basically threatened me that if I didn't turn in Reagan's paperwork, she was going to stop coming. (The vision therapy goes through the school system so you have to turn in paperwork at a local school as if your child were attending.) Well, I've been waiting on a letter from her pediatrician that explains why she's not current on her vaccines (or even close). That letter just came in the mail Friday afternoon and I haven't had the time today to go by the school to turn it in. So we rush home from Reagan's other therapies only to find that apparently she's not coming. She needs to call and at least give us a heads up. Talk about irritating. I did finally hear back from Reagan's neurologist tonight. He went over her EEG very carefully and he thinks the majority of twitches we are seeing are just that...twitches. They are non-epileptic and therefore not seizures. He actually said that he saw very few seizures on her EEG and that it appears to be slightly improved over the last one she had there (over a year ago). Since we didn't get anything with her sleeping, he can't say whether or not the hypsarrhythmia has improved. I'm guessing not. I would sure love for her to outgrow Infantile Spasms but I don't think that has happened yet. He didn't mention the laughing (and I forgot to ask) but I'm guessing it was nothing or he would have brought it up. He's in agreement with increasing the Banzel a little more. She's already at a pretty high dose but we're going to increase her pm dose to 1.5pill so now she'll be at 550mg/day starting tonight. I would LOVE to see some improvement with this increase. Please keep her in your prayers. Reagan didn't sleep well again last night. She kept waking up screaming bloody murder. She'd calm down fairly quickly, but waking up like that can't be good (not for any of us). I don't know if she's waking up with a seizure or just a bad dream, but it's not fun. I did take advantage of her time up and got a couple extra ounces in her at 3am. She's been in a good mood today though. Happy but super mellow (but not sleepy). She's been very floppy and quiet...no talking whatsoever. No signs of tummy pains lately (knock on wood), because when she's happy, we're happy. Grandma was here again this weekend, so that always helps to keep her smiling. Although she wasn't too thrilled when I tried to get her casts back on her tonight. I stretched and stretched her beforehand but after only 2hrs of wearing them BOTH feet were bright red on the tops AND the heals. I give up! I tried my best and it's just not going to work. I guess I'll have to call her PT tomorrow and break the news (although I think the soonest we can get back in for new casts would be on Thursday). I'm hoping we'll hear back from her neurologist tomorrow morning about the results of the EEG. Based on the results, he will decide what changes we need to make to Reagan's medications. If you could say an extra prayer for guidance in his decision making, it would be greatly appreciated. I want these seizures to stop already. Tonight I watched the 60 minutes piece about Epilepsy and they were talking to a soldier that had seizures as a result of a brain injury in Iraq. He was saying how every time he'd make progress (he was learning how to walk and talk again), he'd have a seizure and it would wipe out everything he had just learned and he'd have to start all over again. Now imagine having hundreds of thousands of seizures everyday. It's no wonder Reagan has been at a complete standstill developmentally. Poor thing. I just want some relief for her. Please keep her in your prayers. This pic was taken Friday (with post EEG hair), when the casts were fitting her correctly (before I took them off for the first time). 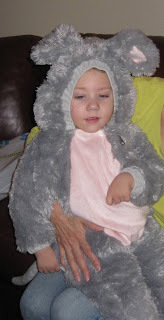 This is a mouse Halloween costume my mom bought for her last year (hoping she could wear it this year). I think it's just darling but it doesn't fit her (she's too long) and she was not happy about it! So...the removable casts are not working out. After Reagan's crying last night, she did have a little red spot on her right heal this morning. She was very tired and slept in late so I took advantage of that and put her casts back on her while she was sleeping (hoping to get a better fit). After waking she only wore them a few hours and started getting fussy. I looked at her foot and you could tell she had wiggled it up in the cast because her toes were not hanging out as far as they should have been. So once again I removed the casts to check out the situation and it was bad. Her right foot was red on the top and her heal was super red and looked like it might blister. They've stayed off the rest of the day and that poor heal is still red. I don't know what to do. I can't try it again until after the redness goes away but I have a feeling we're going to have to go with regular non-removable casts the next time around. It just feels like we wasted a week. Feeding is still beyond difficult. Reagan is just not hungry (or thirsty)...period. I'm trying just as much or more than I was before but she's eating less (by eating, I mean drinking). The problem is that when she doesn't eat, she's also flirting wth dehydration. Today she had a wet diaper when she woke up and then didn't go again all day long until right before she fell asleep tonight. That's not good. I'm not sure what to do. I think I'm going to ask her doctor about an appetite stimulant (if I ever hear from him). I hate the idea of having to give her anything else, but if she doesn't pick up her fluid intake I'm worried she'll end up in the hospital hooked up to an iv. Hopefully she'll sleep well tonight. Last night was rough and she's been up all day long...that's right, not one single nap all day for her. You could tell she was sleepy at times but then she'd just snap out of it and start going strong again. She's a handful alright. OK, busy day. So much so, I didn't write out an entry...for the first time in a year and a half of blogging! Well, here's the summary of events for the day. Reagan slept well...she went to bed early around 9pm while we were at Bible study and then slept straight through the night and I had to wake her up at 8:30am so we could take medicine before heading to TX Children's. Reagan was a DREAM for the procedures. She's never been so good for an EEG. I told the tech that she usually cries when they scrub her head before applying the electrodes, so she was a little more gentle and it worked out well. I didn't even pick her up, I just sat beside her and she just laid happily on the bed the whole time! Definitely a first. Another first is she did not sleep during it. I knew she wouldn't and I told her doctor ahead of time (she's only taking late day naps right now), he said that was fine since we were mainly looking at the twitches and laughing both of which happen when she's awake. We got plenty of twitching and a couple small laughing episodes on film, but when the tech took the electrodes off and was scrubbing gunk out of Reagan's hair, she went crazy laughing!!! Hello...that's what we were trying to get! Oh well, too late. (We're yet to hear from the neuro with the results...still no answers.) Then we headed over to casting. This was an interesting process. Reagan has had this done before by an orthopedic doctor, this time her PT was doing it and they do things a little differently. For one, they pad and pad and pad...the orthopedist did things at lightening speed and there wasn't much padding other than a little cotton. Second...this cast is removable (although she's supposed to wear it >22hrs a day). They put it on her and then cut it back off. Then they line the open edges with more padding and apply velcro strips. Kind of like super bulky AFOs. Reagan was wonderful...she just laid there on a bean bag chair while they did this to her. We really couldn't have asked for her to be any better! Once we got home I was very hesistant to take them off. Just afraid that I wouldn't get them back on correctly. We eventually did after maybe 8hr on and her leg looked great, not red and sore like when she wears AFOs (although this is more of a gradual stretch than AFOs since it's taking place over 6weeks). We gave her a bath, attempted to get some of the yuck out of her hair, and then put her casts back on. I think they were fine, she didnt' cry like they were hurting her or anything. But she did stay up late. Mike and I went to a prayer event at our church and left Reagan with Grandma. When we got back after midnight, Reagan had just fallen asleep! My mom thought she just couldn't get comfortable with the casts on. Well, that might have been true because she was up and down and fussing all night until at 3am when I just took the darn things off. Oh well. She might not be able to sleep in them. We'll see. Little turkey. She's just lucky they are removable. Today was a little less stressful than yesterday...although Reagan did throw me for a loop last night. Mike attempted to lay her down last at 11pm...she was not having it. So I stayed up with her waiting for her to wind down and get sleepy...didn't happen. Finally at 1:30am I gave up on her getting sleepy and I put her in her bed awake and I put myself to bed. I was hoping we could sleep in a little but she woke screaming at 7am and ruined any chance of that. We didn't have anything scheduled all morning (that's a first), so our helper was able to work with her in her therapy room for a while. Reagan's been less talkative and smiley than she was earlier in the week...she's not fussy, just calm and quiet. Maybe it's the increase in seizures spoiling her fun...I don't know. They have gotten worse as the week has gone on (more twitches and more big spasms that knock her for a loop). She's got the EEG scheduled for tomorrow morning and I'm a little nervous that they won't catch everything they need to see on a measly 1hr EEG. I really want some answers. Are the twitches seizures? Are they epileptic? What about the laughing episodes? Are those seizures? What next? Do we increase the Banzel further? It certainly has helped with the tonics, although it's not even supposed to help those (it was given with the intention of helping with the myoclonics)! HELP!!!!! Please say some prayers about all of this. We need some direction on where to go next and we need it from Him! And then if an EEG wasn't enough, we go straight from there to meet her PT for casting! I can't really think of two more unpleasant things to have scheduled back to back. Hopefully we can keep Reagan calm through all of this. Continued prayers are definitely appreciated. Today hasn't been a good day. Reagan slept in late this morning (which is usually a good thing) but I had to wake her up at 8:30am so I could at least get her medicine down her before we had to hit the road (and she was having more seizures than we've been seeing lately). We had a 9:30am appt with the Dentist at TX Children's so we didn't have time to try to get some real food in her, just medicine (bad idea). A huge issue is that Reagan doesn't get hungry, so if she skips a meal or it's delayed, she never really catches back up for the day. And for some reason right now (maybe it's the teething) she's really fighting me and not wanting to drink her bottles at all. It literally just drips into her mouth and she may or may not swallow it. Anyway, the first comment out of the super personable Dentist's mouth (not) was "I see she's still on a bottle"! Then he opens her mouth says "She's a grinder". No kidding...but I guess it's obvious by looking at her teeth that they've been ground down a lot. Then I hear, "Cavity, cavity, cavity..." Ugh. My heart sank. Apparently she's not only got cavities in most of her molars, they are just completely rotten. She can't even have fillings, she's going to have to have caps/crowns put on all of them. Those yucky silver things. He said that's what they always use in the back of the mouth. They are very durable and should stay on no problem and even withstand the grinding. I just hate the idea of my baby having to go through yet another procedure. We scheduled it for Dec 30th (their first opening). It will be done as a day surgery, they'll have to put her under general anesthesia and then they'll do x-rays to check all her other teeth (which they've never done and I'm afraid they'll find more problems), then they'll address everything all at once. He said that as long as she's drinking bottles as her main source of nutrition, this is going to continue. I don't know what to tell him. It's either bottles or a g-tube! The main problem is that she doesn't clear her mouth of the spit, it just sits there covering her teeth with the sugary residue leftover from her formula. If she would just swallow already! Hopefully by the time she gets her permanent teeth she'll be eating real food. So needless to say, this was not a good way to start out the day. I'm still feeling a little woozy just thinking about it. Then we headed over to physical therapy, we were running a little late, but her therapist had been forewarned and she was waiting and ready to go when we got there. She actually worked with her a full hour because the person that was scheduled after Reagan had canceled. So at least that worked out well. We were supposed to go to Feldenkrais next but we didn't have enough time to go home, so we grabbed some fast food and as I was trying to get Reagan to drink some of her bottle in the parking lot, when her practitioner called me and wanted to push the session back! Well, that wasn't going to work because I had already rescheduled OT to come later in the day after the Feldenkrais session. So we ended up just having to cancel Feldenkrais for today. I was not amused. So we left the parking lot and headed home where she did have a really good OT session. But even when we got home Reagan still did not want to eat! I managed to get her to drink a 4oz bottle in her sleep while she took her afternoon nap. She still coughed and choked a few times, but I was desperate. Of course, now I'm super paranoid about her going to sleep with milk in her mouth. Tonight I brushed her teeth and gave her a few squirts of water before bed. I don't want any more teeth rotting out! The problem is, I usually end up caving and giving her another bottle before she goes to sleep. Every ounce counts with her and sometimes that means feeding her until she falls asleep! Why does everything have to be so difficult?!?! Please keep her in your prayers! What a waste of a day. I hate running around and then feeling like I got nothing accomplished! We had an appointment to meet with the surgeon who will be performing Reagan's muscle biopsy to check for mitochondrial disease. He was super late. We sat in the room for over an hour before we saw anyone whatsoever. First the fellow came in, she asked some questions as to why we were having this done, yada yada yada and then she came back with the doctor. He was in the room for all of 2 minutes max! It was anti-climactic, but we were already late for aquatic therapy, so I was ready to get out of there. His secretary called me later in the day to set up a date for the surgery and she gave me a choice of two dates...both very soon. I went ahead and set it for Nov 4th, but I'm not too happy about doing it so soon. I was hoping to wait until sometime early to middle December...after we finished up with the casting. Oh well. I guess we'll do it their way. At least we'll get the results back sooner. One thing I'm not thrilled about is that they will be doing the testing on a frozen biopsy. There's a big controversy regarding mitochondrial testing on fresh vs. frozen specimens. There are actually only a few centers in the US that do the fresh specimen testing because it has to be done immediately (and apparently this is not one of them). Some doctors say that the testing done on frozen specimens isn't as accurate as when it's done on fresh specimens. I don't know. I would prefer to have it done correctly the first time, so there's no second guessing, but I guess I can't make them change their policies just for us (is that too much to ask?). So after our appointment we headed over to aquatic therapy. We were very late and Reagan would have had less than 30min in the pool, so we decided to just skip it this time. She's been a little droopy today, so it's probably better she skipped being in the pool. I talked to her therapist for a few minutes and then we headed home. It's frustrating because out of 6 scheduled aquatic therapy sessions, we've only completed 4, one of which Reagan screamed the entire time! So that was it. Only one therapy scheduled for the day and we didn't even do it! Tomorrow the schedule is jam packed and we should more than make up for the missed therapy today...hopefully Reagan will be up for it. Tonight she was running a fever of 100, but with her ongoing teething, it's so hard to tell if it's just teething or something more. Hopefully just teething. Please continue to keep her in your prayers! Reagan did wake up crying last night but she fell back to sleep fairly easily once I put her in bed with us. I guess she just wanted to cuddle. She's been in a great mood today, which is good because we had a really busy day. It started off with Feeding therapy, then Feldenkrais, and then Vision therapy back at our house. Lots of running around. Thankfully she was full of smiles and giggles again today. Such a sweetie. She's gotten to where as long as she gets a good night's rest, she only takes one late nap a day (usually around 4 or 5). That works out well considering she's got so much going on right now. This week is a super busy week. We've got appointments at Texas Children's every day Tues-Fri. I'm not thrilled with having to be up there so much, considering all of the concerns about the flu, but we don't really have a choice. Speaking of, I woke up this morning feeling a little yucky. My throat is sore, there's a tightness in my chest (feels like bronchitis), and I've got a runny nose and I've been sneezing a lot (although that could just be my year round allergies). I cannot afford to get sick. I don't have the time for it and I certainly don't want to transfer anything to Reagan. We have some Tamiflu on hand if we should see any symptoms in Reagan but hopefully we won't have to use it. I guess all we can do now is just wash, wash, wash, purell, purell, purell...and hope to steer clear of it! We did get a call this morning about the EEG, it's set for this Friday at 10am. I'm glad they were able to get her in so quickly. Maybe we'll get an idea of what's going on sooner than I thought. I'm still a little concerned about all the giggling. I just want to make sure it's actually laughing and not gelastic seizures. I'm not sure if we'll catch everything we need to see on an hour EEG but I hope so. We need some answers. As always, please keep Reagan in your prayers. Last night was definitely an answer to prayers. Reagan slept the night through, til 8:30 or so, and we all got some much needed rest. She's still in a goofy mood though. Lots of babbling, but it's kind of a crazed babbling at times. I don't know how to explain it. And then the giggling. She's never been easy to get a laugh out of, but now she'll just break out into spontaneous laughter for no particular reason. Sometimes she does it after a seizure, but most of the time I can't link it to anything. It's oh so cute though. I really have to track down the video camera and get it on film. Now you may have noticed that I haven't mentioned seizures in a while. That's almost always a good thing. I hate to say anything when I see improvement for fear that I might jinx it...but we could certainly use some prayers in this area so here it goes. Since we last increased the Banzel (1pill am and 1.25pill pm) there has been a definite change in seizures. I don't think I noticed it until a couple days after the increase...I think it was Monday. The twitches decreased significantly and the tonic seizures have been few if any. The improvement was obvious (although we were hesitant to even speak of it) so I held off on increasing the am dose, but when I saw a slight increase in twitches later in the week I went ahead and moved her up to 1.25pill 2x day. Right now we're holding steady at that dose. Seizures are about the same. Less twitches than before but more than we saw at the beginning of last week. I don't know. Maybe we're on the right track continuing to increase the Banzel. Maybe it was just coincidence. Who knows...but I'll take any improvement, for any reason. Please keep all of this in your prayers. We SO want to see longterm improvement in these seizures (or better yet, none at all). I'm looking forward to the EEG so we can finally figure out how serious (or not) these twitches really are. I would love to squeeze an EEG in this week, but honestly we'll probably be lucky to get in sometime in the next two weeks! So last night was interesting to say the least. Reagan woke up around 4 so we put her in bed with us. She laid there beside us talking up a storm. Mike and I were exhausted and hoping she would just drift off to sleep with us...but she laid there for 2hrs straight babbling nonstop! Finally around 6 she started to get irritated so I picked her up and tried to feed her a bottle. She wasn't that interested and still continued to talk while I was feeding her. Finally I just put her back in her own bed and I laid back down. I could hear her in there still talking but I fell asleep and I guess eventually so did she. Then this morning she slept in...big time. I kept waiting for her to wake up but she never did. Finally at 10am I picked her up and attempted to wake her myself. Didn't happen. I managed to get all of her medicine down her but she never even batted an eye! I laid her back down and she slept some more. Around 2pm I picked her up again and I finally forced her to wake her up. This is SO unlike her. She's certainly never been this talkative...it's a little strange. And I don't think she's ever, in her life, slept til 2pm! I know she was sleepy (believe me, I know) but I was definitely getting worried. She seems OK now. It's funny because my mom flew in from out of town just to see Reagan and this little turkey sleeps in most of the day! It was nice though because tonight my mom watched Reagan and Mike and I got out for a little while. Nothing too exciting...dinner and the grocery store...but just getting out of the house was a plus. We SO need sleep tonight. I am beyond exhausted and Reagan is just as talky tonight as she was last night! Prayers for rest and rejuvenation would certainly be appreciated. Last night was a good one. And thank goodness, because I sure needed to recover from the night before. Reagan slept though til 8:15 or so this morning. She woke up happy but was not really wanting to drink her bottle. She's been so very spitty this past week or so (definitely teething) but somehow even while she's drinking she manages to not swallow her spit and then choke on it. I'm especially concerned about this because the biggest complication with Botox treatment is aspiration pneumonia (and several kids have actually died from it). I'm just being super careful...which means extra patience on my part and taking lots of breaks while feeding her. She's been very sweet again today. This morning she was smiley but not as talkative, but as the day wore on she got more and more vocal. She's even doing some mimicking...which is certainly a first for her. She had a Feldenkrais session this morning but her feeding therapy was canceled so we had a fairly laid back day. It's been oh so nice having a helper. She's really jumped right in and works with Reagan a lot in her therapy room. Stretching, doing different visual exercises, working on head control...it takes a lot of the pressure off of me. Reagan went all day today without taking a nap until 7pm!! I know, that's when most kiddos are going to bed, but leave it to Reagan to do it differently. Tonight as I was brushing her teeth, I took the brush out and it was bloody. So the teething hypothesis was correct. Her bottom right molar (#19) is working it's way out...leaving a big whole in her gum that I disturbed with the toothbrush. Poor girl. Maybe that's partially responsible for the huge increase in babbling? Who knows. It's 11:15pm right now and she's still talking up a storm. She's quite the party animal. Here's hoping for another good night's sleep tonight! Two consecutive nights would be nice. Mission accomplished! Reagan slept the whole night in her own bed! She actually didn't even wake up this morning...I had to go and pick her up at 8:30am and force her to wake up so that I could give her her medicine. Then we headed in to Texas Children's for her physical therapy. We started off in the swing room, where it's calm and quiet, and she seemed fine. Then we went into the main room with screaming children and Reagan went into a full blown meltdown! We were attempting to get her strapped onto the Rifton tricycle but it just wasn't happening. Maybe next time, minus the screaming kids. We didn't get to try the walker either. It's so frustrating going all the way there for a botched session. Reagan cried nonstop the whole way home and then took a good long nap that seemed to help. 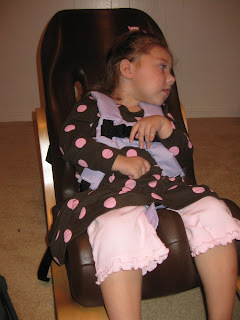 She woke up feeling much better and the ECI occupational therapy session at our house went much more smoothly. She's getting Botox tomorrow so hopefully that will go well. The first time she had it (about a year ago), it went really smoothly and she didn't even cry. Reagan has been super talkative today. She said Reagan (or what sounds like Reagan) over and over again. It was too funny! Then tonight she was insane! She was babbling and making so much noise, we couldn't hear the television over her she was so loud. Then she started to get a little irritated but a stinky diaper was to blame for that. Hopefully she'll get a good night's sleep again tonight. She's got a lot of missed sleep to catch up on...and so do we! Last night Reagan ended up in our bed a little earlier than I would have hoped. That also meant she woke up for the day earlier around 5:15am. The good thing, she woke in a great mood and she's been an absolute angel all day. Very easy going and sweet, quite the change from yesterday's feisty girl. I'm sure her therapist was thrilled to see her so happy (considering the nonstop crying session she had last week)...she was certainly all smiles today for aquatic therapy. Then we came home and our new helper worked with her on some stretching and vision exercises. So far, so good. She's certainly more motivated than our previous helpers...she does things without having to be told, which is good because I'm not always the best at delegating...especially when it comes to Reagan. This afternoon was filled with headaches. Nothing to do with Reagan, everything to do with her neurologist's office. Her neurologist is out of town...AGAIN. And as it turns out the entire office is out all week! So I was wondering why I never heard from the EEG scheduler...he's out too. According to the secretary, they are operating on a skeleton crew this week and apparently Reagan's doctor never made note of the fact he wanted an EEG scheduled so there's nothing we can do but wait for him to come back. I'm beyond irritated! Then there was also tons of confusion over her Topomax prescription...it was out of refills and someone from the office kept refusing the requests by the pharmacy to refill it. After talking with the pharmacy, the neuro's secretary, the pharmacy, the secretary...finally I was assured it was straight. I went to pick it up and 30min later as I was leaving with the goods and glanced down to see that they had given me Topomirate...the generic equivalent to Topomax. Well, everyone that deals with seizures knows that you don't just switch from brand name to generic, so back I went. They had to give me loaner pills until they could get this whole "brand name only" thing verified by a doctor. Ugh. So frustrating. Did I mention I was frustrated? But then I come home to the most precious girl in the whole world! She was so cute tonight! Smiling away and giggling for no particular reason. Just a doll. I hope that little doll sleeps well tonight...in her own bed!!! Reagan woke up once last night and ended up in bed with us. She was crying and upset when I picked her up but a few seconds snuggled up next to Daddy and she was back fast asleep! Little turkey! This morning started off well enough. Our new helper started today and she was definitely a help. Reagan was in a fair mood this morning but started getting a little fussy just as we were loading up to leave for therapy. She continued to fuss/cry in the car and then got pretty hysterical during OT. She had several bouts where she'd cry her breath away and turn purple, but her therapist just worked through it and somehow managed to save the session. She also measured her for some hand splints. Reagan's hands are clenched into a fist a lot (the right more so than the left) so these splints will help to keep her hands open and her wrists straight or bent outward instead of inward. She had some benik splints that were made out of soft neoprene to try to pull her thumbs out but she'd bend her thumbs in against them and they'd turn purple so we never really used them on a regular basis. These will be thermoplastic splints that can be heated and bent to fit her exactly as needed and since they are plastic with a neoprene cover, they'll be more rigid but still comfortable. Then we moved down the hall to feeding therapy where Reagan's therapist (who has the nickname "the napwitch") managed to put Reagan into a deep sleep with her dark lighting and massage techniques! She was out cold, which allowed her therapist to at least get some good stretching done. She woke up just as we were leaving and seemed to wake in a slightly better mood. As we headed back home for her first session of vision therapy I was worried that she was not going to tolerate it in the least...but she actually did OK. I wouldn't say she was super cooperative, it seemed she was ignoring the therapist the majority of the time, but at least she behaved and sat in her chair as she attempted to get her attention. Finally tonight she seemed to mellow out a bit and just be her usual cuddly self. Not sure what all the drama was about today. You just never know with her. Still no word on when the EEG will take place, I guess I should probably inquire about that tomorrow so we don't get lost in the shuffle. Please continue to keep Reagan in your prayers. Reagan really shocked us last night...in a good way. She only woke once around 2am and Mike shushed her back to sleep no problem. Then she slept til 8:30am! I couldn't believe my eyes when I saw the clock! Her mood was also loads better today. Maybe all she needed was a good night's rest. She did have a big huge dirty diaper this morning which I'm sure worked in our favor. Grandma came by this morning to get in some quality time with Reagan before leaving for her new job tomorrow. I put her to work and we hung the Chinese lanterns in Reagan's therapy room. She was in tears as she left. I know she's going to miss Reagan and Reagan just adores her. It really has been a blessing with the amount of time we've gotten to spend together during the time she's been unemployed and looking for a job. She's been such a huge help to me, I don't know what I'll do without her. Please keep her in your prayers as she makes this huge transition that everything goes smoothly. She's driving the 5hrs to Denton tomorrow morning and hoping to find an apartment before starting work on Tuesday. I did finally make a decision and hire a helper. She starts tomorrow so I'm hoping everything goes smoothly. Tomorrow is a busy day, feeding therapy, occupational therapy, and then vision therapy. All pretty much back to back to back. I hope Reagan's up to it! She's been a little sleepy today but now that it's bedtime she's looking way too awake. What a night and what a day! Definitely not the restful weekend I was hoping for. Reagan was up at 4am but she wasn't her usual perky self. She was very moany and groany. It was two hours of this before she finally settled down and was able to fall back asleep. Unfortunately it didn't last long. She woke up for good at 7:30am. And it was clear that something was just not right with her. She's been this way the entire day. Moaning and crying off and on all day long. It could be one of many things, and we have no way of pinpointing which. She didn't get much sleep last night, so maybe she's just over tired. Every time she would fall asleep today it was extremely short lived, usually waking back up only minutes later with a seizure. It was heartbreaking. She was so extremely tired, but she just couldn't stay asleep. Maybe the Banzel increase is causing this strange behavior. It does seem like the Banzel has had more of an awakening effect on her, especially considering most seizure meds do exactly the opposite. She also seems to be having way more seizures in her sleep. Mike thinks that she's just not getting to a deep enough sleep and that's why she's still getting hit by seizures. Who knows. Maybe she's getting sick. We have no way of knowing if she's experiencing aches and pains. She's still teething (with the occasional low grade fever), so maybe her gums are hurting. She's also been 5 days without a bowel movement, that could be causing problems as well. Who knows, it could be any one of these or a combination of them all. No clue. All I know is that I'm dreading tonight. I hate to say it, but I have little hope that she's going to sleep tonight. I hope I'm wrong. We all really need some sleep. Please say a few extra prayers for this little one! So sad...just not herself today. This one is from last night, before she started feeling crummy. I really like the chest straps on this special tomato sitter...way more supportive than the tumble forms chair. Reagan did manage to sleep last night, maybe all the crying wore her out. She woke up at 6am feeling fine. Actually she was very calm and mellow all morning. We took her in for an appt with the Physical Medicine & Rehabilitation doctor, basically just to catch up and talk about the Botox scheduled for next week. 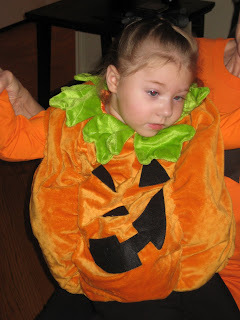 We discussed Reagan's dystonia and spasticity, she clarified that Reagan has a combination of both. It's funny because we were talking about her extreme tone but while we were there she was extremely loose almost floppy. We had her look at Reagan's left leg and she thinks Reagan definitely strained something behind her knee. She was very sensitive to her messing with that area. She also said that Botox/casting may not be enough to fix Reagan's contractures in her ankles...and that we may have to consider surgery at some point. Lovely. She's also very skeptical that the removable casts her PT wants to use are going to work. We may have to give up the water therapy while she's being casted. I don't like the sound of that but I guess we'll just see how it goes. I did finally speak with her neurologist...he called first thing this morning. He said that Banzel has the tendency to get metabolized quickly by children and that their blood levels are often way lower than the actual dose. That being said, he wants to go a little higher. We're going to increase it to 1.25tab 2x day starting tonight (that's 500mg per day). He also wants to get her in for an EEG to check to see whether or not all of these twitches she's having are epileptic. She was having similar nonstop twitches over a year ago when she first started vigabatrin and an EEG determined they were not epileptic. I would like to get her in ASAP for this EEG but with next Monday being a holiday and the fact that I never heard from the scheduler today, it doesn't look good. I just don't want to keep her on this medication much longer because (so far) it's doing nothing whatsoever to help her. 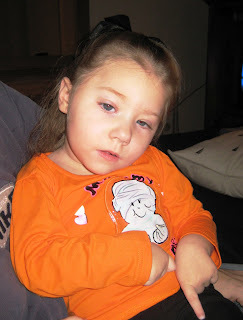 The problem is, we are really out of medications to try, at least those that are known to help her type of seizures. Reagan was a little excitable this afternoon...exactly opposite of this morning. Very high tone and on the edge...I just hope she's able to settle down and sleep tonight. I was hesistant to increase her pm dose of Bazel afraid that it might affect her sleep, but I did it anyway. Please keep her in your prayers. Reagan slept in a little later this morning, waking up at 6am instead of her regular 4am. Thankfully her tummy seemed settled, no repeat occurrence of the throw up from last night. I'm still not sure what that was all about. I did notice this morning she has tiny blood spots on her face (the size of a pin prick) known as petechiae. They were around her eyes, cheek, and chin. It worried me a little because those are sometimes associated with more serious conditions like blood disorders. I spoke to her pediatrician's nurse and she said that it's probably just due to the force from throwing up but to watch it and make sure it doesn't spread. That makes sense. No therapies today, although we did have Reagan's annual ECI evaluation. It was strange since none of these people have ever worked with Reagan and here they were reviewing her "progress" or lack there of. They always preface these things by saying that it will probably be unpleasant for us, as if we are unaware of the fact that she's not progressing. Helloooooo?!?!? Of course we know. So she's at a 3-6month level in all areas. Not that surprising. I certainly didn't need them to tell me that. We did finally meet her vision teacher today. She was full of excuses as to why it's taken her so long to get started (and she doesn't officially start until next week). She also has no real slots open, so we have to work around her schedule in order to fit Reagan in during her lunch breaks. That should be fun. Personally, I don't think she and I will get along, but she seemed to interact well with Reagan so that's all that matters. Tonight we had Bible Study. It's about 45min away (only 10min from our old house) and Reagan's tummy pains reared their ugly head about 30min into it. We tried our best to soothe her but we ended up just having to leave. A bit frustrating considering the drive and the fact that she cried nonstop all the way home. It's so frustrating the way these things just overwhelm her with pain! I spoke to the GI nurse today and told her about the fact that the tummy pains didn't reemerge until we changed her reflux med. The Nexium wasn't stopping her reflux but maybe it was doing something else (in combination with the Duocal) to help soothe her tummy. It doesn't really make sense to me but we're desperate so we're going to switch back to see if it helps. Reagan's neurologist did finally call us at 8pm tonight but we weren't home so hopefully we'll hear back from him tomorrow. Please keep Reagan in your prayers...lots of seizures and tummy pains sure doesn't make for a happy girl. Reagan did the same thing last night as the night before. Apparently 4am is the new 7am! Again we laid her in bed with us and again I had a really hard time sleeping with her beside me. She's very restless and kept poking me in the eye with her sharp little fingernails! This morning's PT session went loads better than the aquatic therapy yesterday. She and her therapist actually spent the entire time on the swing (making me think we need one like that). 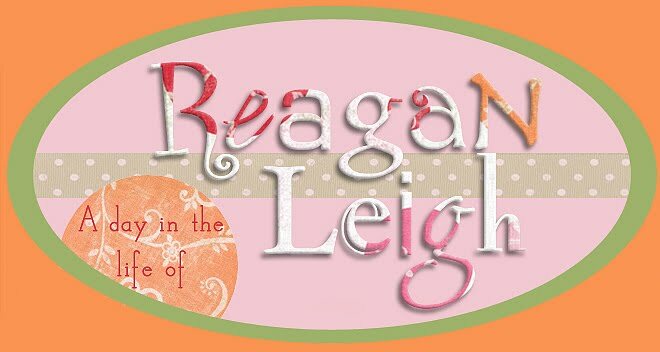 It's a big, rectangle bolster-like swing and she did all kinds on interesting things with Reagan on it. At the end of the session we discussed equipment a little. She thinks Reagan would benefit from a Rifton Special Needs Tricycle. It's hard for me to imagine Reagan on something like a tricycle, but I guess there's a lot of support and it would be good to get her legs moving like that. We're going to try it out with her next week. We also talked about walkers and standers...which she's really going to need once we do the botox/serial casting again on her feet (which will be happening over the next two weeks). So, the first half of the day went off without a hitch. Then tonight she started getting irritable. I broke out the bottle and plugged her up. She drank a 4oz bottle of formula and then 3oz of prune juice but she just wasn't settling down. Her head felt a little warm so I broke out the Tylenol and as I was trying to get it down her I heard the tell tale sounds of rejection. She threw it up! She threw EVERYTHING up. Poor baby. I sure hope she's not getting sick. I'm thinking it was a combination of her having an extremely full tummy and the fact that she's been known to throw up grape Tylenol in the past (but I was hoping she was over that). Since she didn't get any of the Tylenol down and then I couldn't really give her anything to drink to soothe her...she was miserable. I handed her off to Mike and rushed to the pharmacy to get some Feverall (the rectal equivalent to Tylenol). Our usual pharmacy was out of it, so I sped down the road to another 24hr pharmacy and they were out too! Then I went to a nearby grocery store...out. Finally I looked up pharmacies on my GPS and started calling until I found one that was open and had Feverall in stock. It was about 12miles away, so I booked it down to that pharmacy and picked up two boxes. An hour later, I got home and Reagan was already alseep in bed. Ugh. Mike did say that about two minutes after I left, she cheered right up and was smiling and babbling. Go figure. Please keep her in your prayers. We do NOT need anything else to deal with right now. Seizures are still yuck. I never heard back from her neurologist today. She's doing a lot of twitching (specifically her elbow) while she's sleeping. No wonder she's having a hard time sleeping. Lots of prayers needed for this little one. Reagan has been a little off today. She didn't sleep well last night. She woke up around 4 and we put her in our bed where she fussed and tossed and turned until her regular wake up time at 7. She seemed well enough, drank her bottle and took her medicine. Grandma accompanied us to aquatic therapy and she was a little whiny on the way in. When I handed her over to the therapist and she took her into the water, that was it, she lost it! She seriously cried the entire session. I have to give it to her therapist...she tried her best to soothe her. She swirled her around in the water while singing to her, it should have been very relaxing, and finally about 35min into it she fell asleep (in the water). I don't know if it was the lack of sleep or what but she was not cooperative today. Every time she'd doze off, she'd wake up 10min or so later fussing and crying. 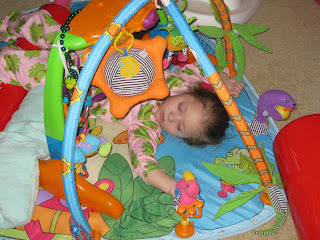 Many times it was a seizure (a big tonic seizure) that woke her up and other times when she would just wake up screaming. I don't know what I'm going to do with this girl! I really don't think Banzel is helping at all (and it may be making things worse). I went ahead with the last increase tonight, she's now at 1pill 2x day. I'll probably put a call in to her neurologist tomorrow to find out what our next plan of action will be. How fast can she come off of this stuff? I don't mind keeping her on this dose for a few days, but if we don't see any improvement, I want her off. And quickly. I don't want to take another 2 months to wean her off of it. So frustrating. I hate it that we're going to have to look for something else to try. Why couldn't Banzel have done the trick? Why is it that Reagan does not respond positively to ANY seizure medications?!?! Frustrating to say the least. I just hope she's able to get some rest tonight and that she has a better day tomorrow. She has PT tomorrow morning with the same therapist, so for her sake I hope Reagan is in a better mood! Please keep our little one in your prayers! Yet another good night's sleep last night, which is a relief because I was worried about that leg. She's still definitely holding it...but we're clueless as to what's wrong with it. I'm thinking maybe she pulled a tendon or something and just has a little soreness in that area. Who knows? Today at therapy her feeding therapist called in a PT to check it out and she said that if it were fractured or broken there would definitely be some swelling and more of a constant pain. Reagan was very content this morning. Very cuddly and relaxed, maybe a little too relaxed. She was awful floppy. We took her to therapy and she started off asleep but then woke up halfway through the session. That always works well. It allows her therapist to do the uncomfortable stretches without any resistance but then she's still able to get some actual "feeding" in at the end. She ate some applesauce (and did well with it for a while) and then took some big bites out of some veggie straws. I think maybe the intense grinding and chomping she's doing with her teeth really helps out when it comes to taking good bites/chewing. Of course, she did do a good job at managing the bites and swallowed them down without a fuss. While she was sleeping we did get a good look at those molars on the right side trying to push their way through. I think she's definitely teething. Question is, how long is this going to last?!?! It's been a little painful this time around. Speaking of pain, Reagan had a monster of a bowel movement tonight and a meltdown to match. It started a little beforehand with some good whining, then the crying started but failed to stop after the diaper was changed. She continued for probably 2hrs or so, nonstop screaming crying. She'd fall asleep and then wake up with a seizure and the crying would start up all over again. 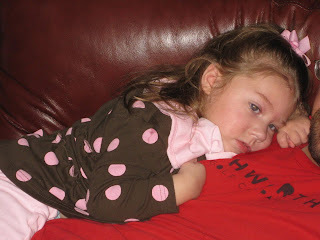 I tried a couple times to lay her down, it wasn't until Mike finally took over that she settled down and fell asleep. I'm hoping she's down for the night. She's certainly worn out, that's for sure. Please keep her in your prayers. Reagan slept from 9pm to 7am this morning! Very exciting. When I went to get her this morning it was still dark outside because of rain...I thought it was still the middle of the night! Her mood today has been just OK. She's been a little fussy/whiny most of the day. Cheeks were still very red and hot, so I'm guessing teething is the culprit. We did have a weird incident today. Mike was holding Reagan and she started screaming. Mike thought maybe her leg had gotten caught in the sofa when he was moving her since she was holding her leg bent up as if that's what was bothering her. Eventually she calmed down, but she was still bending her leg (which is very out of the ordinary for her). I tried manipulating it, moving it around and putting pressure on different areas, but that didn't seem to bother her at all. I pulled her pant leg up and there was a little red spot on the back of her knee, so I thought maybe something had pinched her. But later tonight Mike tried to stand her up on both legs and she went hysterical again! Is it possible that she's injured that leg somehow? I don't know what it could be! Why would she be fine with me moving it all around but then have such horrible pain when she put weight on it? To complicate the matter even further, she was very fussy tonight and yawning nonstop but fighting sleep. Maybe that had something to do with it too? I don't know. That's about the extent of the excitement today. Seizures have been not so good today so continued prayers are definitely appreciated. Great sleep again last night. I know, everyone is probably getting sick of me mentioning it, but I am beyond thankful for every full night of sleep we get. We've spent so much time being sleep deprived...I don't think we'll ever take a good night's sleep for granted. Reagan has been in a pretty good mood today. Still definitely showing signs of teething. Red hot cheeks, a low grade fever, and lots and lots of tooth grinding. It really is like fingernails on a chalk board, but there's nothing we can do to get her to stop! Telling her to stop hasn't helped so far. I did go ahead with the Banzel increase today. She's now at 1 tab (200mg) in the am and 3/4 tab (150mg) in the pm. Seizures did seem a little more mild today. Maybe the increase will help? We'll go up to 1tab 2x a day and if we don't see real improvement, it will be time to wean. I'm not sure what our next step will be. 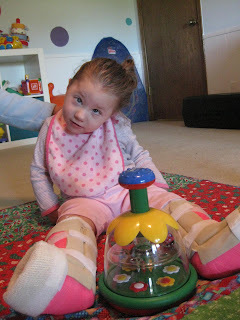 We've never really discussed it with her doctor, but she's already tried (and failed) the medications that are known to treat her type of seizures. Hopefully we won't have to go there. Please keep it in your prayers that Banzel will come through for her. Reagan slept well last night, which is amazing because both Mike and I were awake due to a huge electrical storm raging outside! She seemed happy enough when she woke up today but as the day wore on she had multiple occasions where she was fine one second and the next second she's screaming crying and holding her breath. I think it's her teeth. This morning her right cheek was bright red and burning hot, so I reached into her mouth and put my finger at the back of her gums and I think I feel a little something brewing just under the skin. I gave her Tylenol twice today, but it hasn't seemed to help. She's on edge. You look at her the wrong way and she's moved to tears! She's just not herself. I did go back over previous posts in April (the last time she was teething) and found that she was grinding her teeth a lot and extremely irritable. Sounds familiar. Maybe that's it. She's just teething. It's so hard to think in the normal realm of things, considering we live our lives outside of the norm. With Reagan's volatile mood today, I'm glad we finished off all her therapies for the week yesterday. Today we didn't have anything going on and spent the whole day at home. 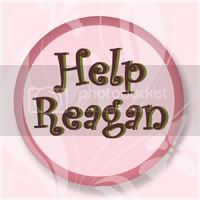 I am starting my search (once again) to find someone to help me out with Reagan. Thanks to the Medically Dependent Children's Program we have funds to hire someone, but it's easier said than done. Previously I just posted an add on Craigslist, but that didn't go very well, so this time I found a website called Care.com which has been very helpful. They actually have a section specifically for special needs caretakers! I was amazed and wondered why I had never seen this before. Anyway, I posted an add and have several applicants that I'm considering. I'll be conducting interviews over the next several days and hope to hire someone ASAP (although I want to make sure I hire the right person). Time is of the essence because my current helper (my mom) will be moving soon! She's been unemployed and looking for a job for months now and she finally was offered a great position with FEMA but it's 5hrs away. She's been a huge help to me, and Reagan and I are going to miss her like crazy. She's going to come back on weekends though, so Reagan should still get plenty of quality time with Grandma. Whoever we hire is certainly going to have big shoes to fill. Please keep it in your prayers that we find the right person this time around and that everything goes well with my mom and her new job. Another great night's sleep last night. Reagan woke up this morning just smiling and talking up a storm! She was extremely vocal all day long. She had Feldenkrais this morning, which went way better than the last couple sessions. She was very attentive, watching the practitioner and making lots of eye contact with her and babbling the whole time. Her practitioner is actually leaving tomorrow for another week of advanced training with Anat Baniel in California. I'm hoping she comes back with new ideas and moves to try with Reagan. That will leave us with a lighter load next week. Less driving back and forth is always nice. After Feldenkrais we headed over to feeding therapy. Her therapist did lots of mouth stretches, which would have left me upset but she was fine. She ate some applesauce and then chewed on some gummy bears. She even left her therapist a nice stinky diaper right before we left (with no crying). Oops, I felt bad leaving her room all stinky! I guess better there than in the car! All in all, Reagan's had a pretty great day. Especially when you compare it to the last few days. It was certainly a change for the better. Please continue to keep her in your prayers. She could use a few consecutive good days and less seizures would certainly be a good start!